Chip Bit Sid - Page 13 of 47 - An extremely passionate music blog focusing on celebrating the greatness of chiptune, 8bit, synth, retro, gameboy, and anything geek related. Last week I decided to take a break and put all my efforts into my chipwin submission. I doubt it’ll get excepted but fingers crossed anyway. 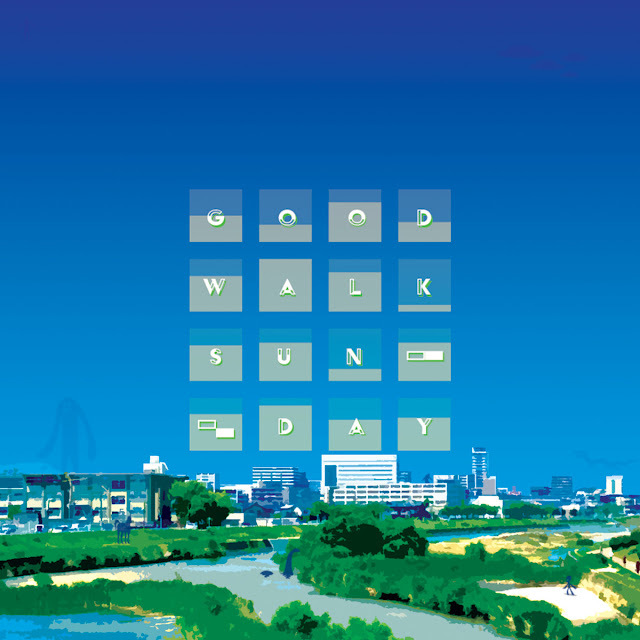 Today I’m reviewing ‘Good Walk Sunday’ by Maru303 (and released via ‘Scaffolder Recordings’), an artist who resides all the way in Japan and has been making chiptune music for over 5 years (according to soundcloud). I first came across ‘Maru303’ & ‘Good Walk Sunday’, when I was had one of my usual bandcamp marathons; wading through dozens of chiptune albums, trying to find something that catches my ear. What drew me to ‘Good Walk Sunday’, was the fact Maru had decided to use the Nanoloop App on their phone, rather rely on LSDJ as most people generally do. Since getting into making music on Nanoloop, I’ve been trying to find more tunes made on it. So finding out ‘Good Walk Sunday’ had been made using Nanoloop, really enticed me to give it a listen. Right off from the bat, you can immediately tell that ‘Good Walk Sunday’ is one of those albums, that are meant to be chilled out to. The opening track, ‘Day Chime’ starts with some lovely & relaxing melodic synth, ringing out and almost sound like a chime clock (it is called, ‘Day Chime’ after all). Although it feels rather minimalistic, ‘Day Chime’ is anything but. Relying on each to sound & instrument to create a soundcape, with some parts, such as the PWM synth slowly floating underneath, then filtering out into silence. Certain sounds have been created in Nanoloop perfectly; for example, one sound at ‘2:08’ really sounded like an old sitar being played. This alone really made that part of ‘Day Chime’. Whilst ‘Day Chime’ is a fantastic opening track to start from, I feel ‘Good Walk Sunday’ really comes into it’s own element further down its track list. That’s not say any of its tracks are bad, but I feel ‘Maru’ starts to get more progressive as the album drives on, relying less on melodies and the cutesy aspect that are found in ‘Day Chime’. Tracks like ‘Long Far’ really show off ‘Maru’s’ willingness to experiment with nanoloop, and not remain comfortable in one pattern. Maru also seems to try and create more soundscapes, by melding certain sounds together, making an effect almost similar to what you get from ‘Bi-aural Beats’. Just listening to ‘Long Far’ for a few minutes can cause you to go into a trance and become incredibly chilled. ‘Good Walk Sunday’ was a very nice & refreshing album to come across this year. Through its reliance on melody & soundscaping, ‘Maru303’ really shows what Nanoloop is truly capable of. Although ‘Good Walk Sunday’ was incredibly chilled out, there were a lot of unique sounds to hear & listen to, and will keep you glued to from start to finish. 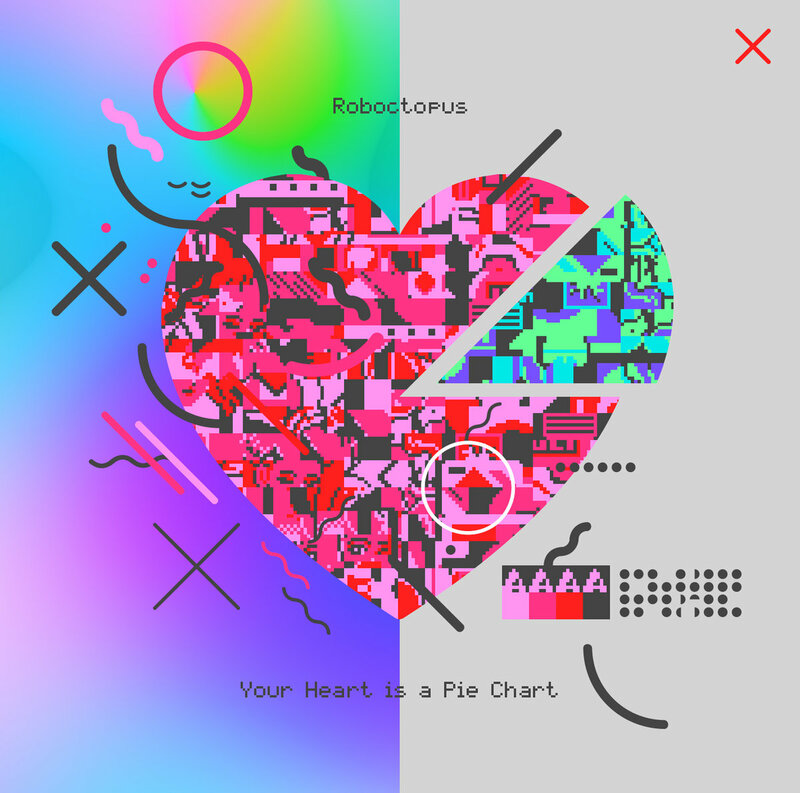 It’s a real scorcher up in Manchester, so what better than to review ‘Your Heart Is A Pie Chart’ (released via CheapBeats) by long time chip musician, ‘Roboctopus’. Residing in Maddison, USA, ‘Roboctopus’ has been making chipmusic for well over 5 years now, establishing himself a following as one of the greats in chiptune. Primarily focused using gameboys to make his music, ‘Roboctopus’ has been pushing the sound chip to the max, thinking up new ways on how to convey sounds, whilst keeping it all melodic. It has been three years since ‘Roboctopus’ released his previous album, aptly named, ‘Jelly’, so this latest release has been highly anticipated; and let me tell you, it doesn’t fail to deliver. A lot of ‘YHIAPC’s’ tracks are quintessentially unique, however one track which particularly caught my ear was, ‘Slow Motion Sunset’. Although the Roboctopus’ titled track (Your Heart Is A Pie Chart) was a good song to begin with, I felt this one really captured what it set out to do. Every instrument rings out to produce a perfect & mesmerising sound, that both hooks & chills you out. The beginning particularly is a stand out part for me, as the bright & melodic sounds feel incredibly uplifting, as well as being a great fit for a sunny drive in the car (true story). However this is further worked on at ‘3:12’ where ‘Roboctopus’ introduces a very wet & stacato-esque square-wave. That riff solely makes you feel as if you’ve just plunged into a swimming pool! Finally to give the track one huge send off, Roboctopus changes it up with a new chord progression as well as, a slow but catchy lead that drums in the notion that ‘Slow Motion Sunset’ has a lot of heart! ‘Slow Motion Sunset’ is a great melodic track to show Roboctopus’s charm, however there’s one track which really shows his real talent, and that has to be ‘Waste LAN’. How every bit of this song has been created is anyone’s guess, but I can tell you that the majority of it is done through LSDJ’s manipulation of the WAV channel. Two gameboy’s are also utilised together to allow for more sample mixing. The introduction itself, is sublime. The jazzy vaporwave keys softly floating, whilst another snappy sample (a guitar) is used over the top, complete with an arpeggiated pulsewave. However, ‘Waste LAN’ truly gets into the mix of things at ‘0:49’ when both samples of the WAV’s are hacked rhythmically with such music precision. It creates a soul inspiring soundscape rarely seen in chiptune, but also becomes something entirely different outside the genre too. It was definitely a welcomed track for the middle of June. ‘Your Heart Is A Pie Chart’ is a fantastic album from ‘Roboctopus’, which shows off both his charm & knowledge in music. However what makes this album even more complete is being released in the middle of summer. The amount of feels I had driving in 28 degree heat the other day was crazy. For a while this album has been on my to do list but I never got round to it, until recently when I decided to sit down and listen; this album is called, Chrome Cobra’s ‘Mobile Swarming’. ‘Chrome Cobra’ is fairly new onto the scene, but has quickly been getting popular from playing live at events, 8static, Pulsewave until finally releasing ‘Mobile Swarming’ with Planet Zaxxon. ‘Mobile Swarming’ is a 5 track album, full of funky fresh melodies, killer breaks & mega beats, all created within one gameboy on LSDJ. A good example off what I said prior on ‘Mobile Swarming’ can be heard in the 2nd track ‘Stolen Protocol’. It shows off a nice blend of ‘Chrome Cobra’s’ choice of breaks, but also contains impressive attention to the rhythm through the track, melding well with the drums. I found myself getting hooked easily to each part of ‘Stolen Protocol’, particularly one bit at ’01:44′, a simple yet hugely effective bassy lead. It seemed to flow beautifully whilst the beat & claps pitter pattered around. However that said, there were many other different parts of ‘Stolen Protocol’ that were just as effective & I liked; hell, even now as I get towards the end, I’m caught in the it’s insane rhythm of ‘Stolen Protocol’. ‘Stolen Protocol’ was a well written dark dance track, yet on the other side of the coin, we have the fresh & funky song, ‘Mocktail’. This track comes straight after ‘Stolen Protocol’ and further brings the freshness of chiptune through the heavy use of, melodic bass as well as wonderfully spat out arpeggios. Now, I don’t tend to like apreggios in chiptune at the best of times, but Chrome Cobra has nailed them all perfectly, using the technique to almost mimic side chaining. Another thing I noticed, when ‘Stolen Protocol’ was over, a lot of energy that it brought was left in the lurch. ‘Mocktail’ manages to pick the energy up however, giving a further kick up the arse and the beat more of a swing. Chrome Cobra’s melodies & leads also give a helping hand further on during ‘Mocktail’, by pushing the track heavily onwards and harmonising fantastically. ‘Mobile Swarming’ is a great album which easily shows you how to a chiptune album using just gameboy, packed with LSDJ. His approach to chiptune reminds me of Auracles music style; both are different, however they each just use one gameboy to its full potential. 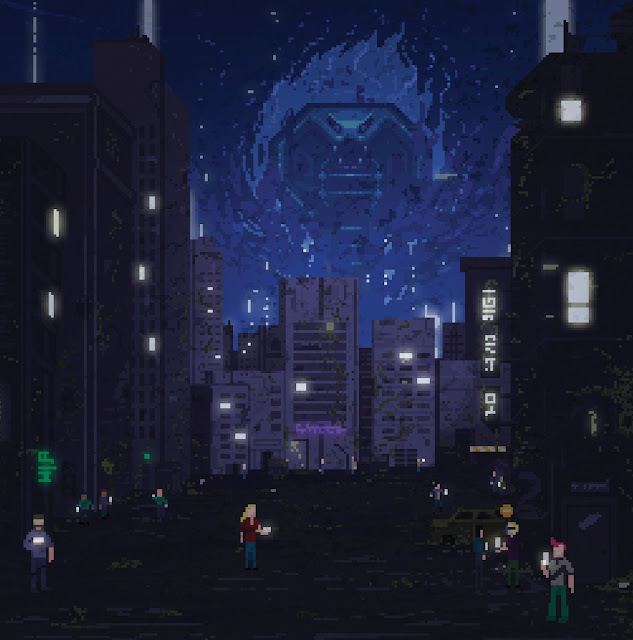 This week it’s time to go back into the American West Coast Chiptune scene, with ‘Paladin Shield’ releasing another album called, ‘Storms At Night.’ If you haven’t heard of Paladin Shield, they are a 3 piece band from Los Angeles, California. The band consists of ‘Tib Van Dyke Jr’ on drums, ‘Lindsay Baffo’ on Guitar/Vox, and finally ‘Jesse Avila’ on Bass, Vox & 8bit Programming. Their first release, self titled as, ‘Paladin Shield’ was met with much praise, and re-released it as, ‘Road To Alchemy’ with extra material & a cassette release via ‘Data Airlines’. ‘Storms At Night’ opens up with the self titled track of the same name. The song starts off quickly, with raw & jagged gameboy programmed riff. It kicks ‘Storms at Night’ with a huge punch, whilst an epic fill of drums is supplied by Tib. Jesse’s voice then comes into fruition, echoing over the guitar, drums & gameboy. One of the things I’ve always loved about ‘Paladin Shield’, is Jesse and his singing skills. It seems to really invoke bands of both old & new, from ‘The Stone Roses’, with Ian Brown’s sombre tone, to the delay filled voice of Adam Kessler, from ‘The Drums’. However that’s not all! With every song, (‘Storms At Night’ especially) you can tell the band members play mega tight together, even when each person has to keep up with the music of a gameboy. ‘Storms At Night’ is a good, song, however I wouldn’t say it’s the best one of the album. That award goes down to the 2nd track, ‘Timberskin.’ When compared to ‘Storms At Night’, I feel the music & vocals in ‘Timberskin’ are far more powerful, both in their energy & tone. ‘Timberskin’, is a lot slower, so it allows each instrument to be heard more easily, as well as leaving much more room for the gameboy programming to make an impact. As well as that, the gameboy leads are also very catchy and I found myself humming along with the music. Finally there’s much of a difference in Vocals of ‘Timberskin’, with the strength of it being found in the melody. It allows for much emotion to come through in Jesse’s singing, especially in chorus, in which he blasts out the words with such raw energy. 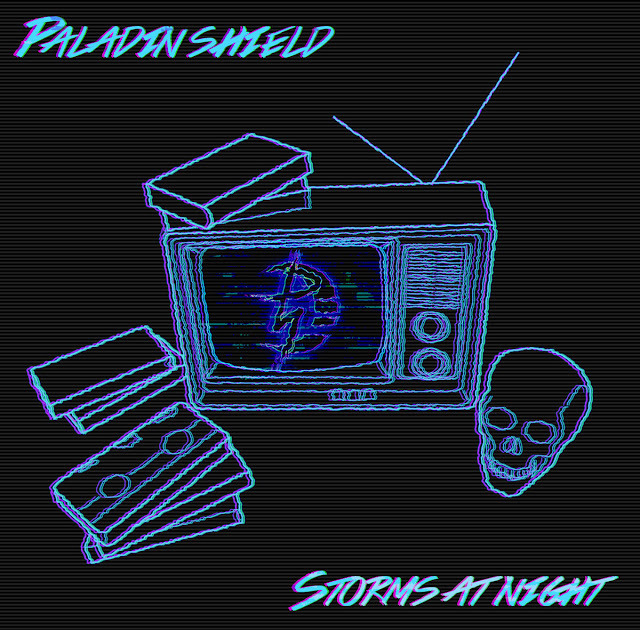 ‘Storms At Night’ is a fantastic high powered EP to show off what ‘Paladin Shield’ have been getting up to since ‘Road to Alchemy’ was re-released last year. I feel they’re trying to be a little more progressive in song writing & gameboy programming as you never really know where the leads or vocals are going. I would say however their album, ‘Road To Alchemy’ was a lot stronger in terms of song structure, but with their signature style already secure they shouldn’t be worried with future albums.